Father and son chefs, Úlfar Eysteinsson and Stefan Úlfarsson of 3 Frakkar Restaurant in Reykjavik, Iceland prove that two chefs in the kitchen are better than one. 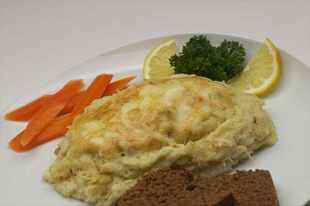 Specializing in Icelandic seafood and traditional cuisine, they provide a tempting taste of the restaurant with their delicious recipe for Hashed Fish Úlfar's Style with Black Bread. In a day and age when restaurants quickly appear on the restaurant scene only to disappear just as fast, 3 Frakkar Restaurant, or Þrír Frakkar as it is known in Icelandic and translates as 3 French Coats, owned by Chef Úlfar Eysteinsson and his family, has been proudly serving its growing clientele for the last twenty years. Long a favorite restaurant with locals since it opened in 1989, the ambience at 3 Frakkar is homey, cozy, features nautical décor throughout, and is conveniently located in the downtown area a short stroll off the main shopping streets. 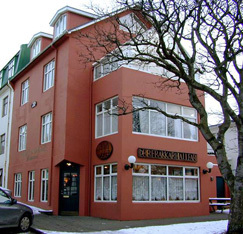 It also is the place to have an authentic Icelandic culinary experience complete with puffin, whale meat, trout, and salmon. 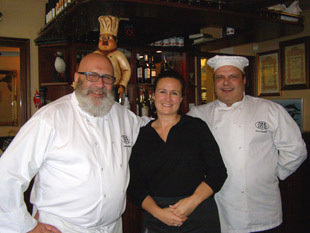 I met with Chef Úlfar Eysteinsson and his son, Chef Stefan Úlfarsson, while I was in Reykjavik, Iceland in late September 2009 and had lunch at their restaurant. 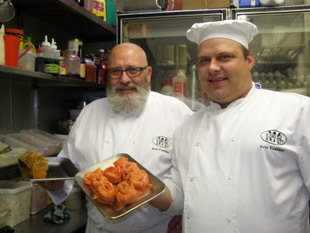 Since the folk saying is "too many chefs spoil the broth" I asked this passionate father and son chef team what their recipe for success was when it comes to working in the kitchen together. They laughed and replied that they work opposite shifts, which works well for them and allows each of them to develop their own creativity and style. Also involved in the family business, is Úlfar's very personable daughter, Guðný Úlfarsdóttir, who is the restaurant's hostess and waitress. When I asked Stefan how he decided to become a chef, he stated that he grew up in the restaurant business working as the dishwasher and watching his father cook. It was a natural progression for him to get involved after watching his father, a master chef, in action day by day, which developed into his learning to cook and becoming as passionate about cooking as his father. Stefan is a big fan of gourmet food, and said that their approach at the restaurant is to use fresh ingredients and utilize local products as much as they can, because "food should not travel, people should travel." Enjoy a traditional taste of Iceland and 3 Frakkar Restaurant from Master Chef Úlfar Eysteinsson and Chef Stefan Úlfarsson for Hashed Fish Úlfar's Style with Black Bread, which they described as a tribute to the Icelandic housewives who would boil fish everyday and on Friday would take all the leftover fish and add a white sauce to it. Their approach to "Icelandic bouillabaisse" is more upscale and utilizes fresh seafood, curry, and béarnaise sauce. Method: Boil the cod (or other fish) and remove from the pot. Heat the milk to boiling with the onion and spices. Melt the butter and mix with the flour or maizena, and stir into the milk. Pour half of the sauce into a container and reserve. Add the rest of the sauce to the fish with the potatoes and carefully mix together. If the mixture is dry, add a little of the reserved sauce. Season to taste and add pepper if desired. Finally, add the cold butter to obtain a softer consistency. To gratin the hashed fish top with béarnaise or hollandaise sauce and cheese, and broil until golden brown. 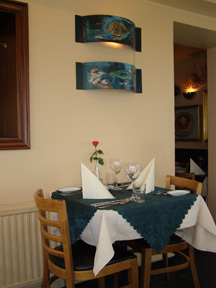 3 Frakkar Restaurant is open for lunch Monday - Friday from 11:30 am until 2:00 pm, for dinner Monday - Friday from 6:00 pm until 10:00 pm, and Saturday - Sunday from 6:00 pm until 11:00 pm. Read about 3 Frakkar Restaurant in the Restaurants and Chefs' Recipes sections where Chef Úlfar Eysteinsson and Chef Stefan Úlfarsson share a taste of the restaurant in Icelandic.